So the world didn’t really see a black hole on Wednesday morning. The big thing about black holes is that everything gets sucked in, even light, meaning we will never see them in the traditional sense – with photons bouncing off them and hitting our lenses. 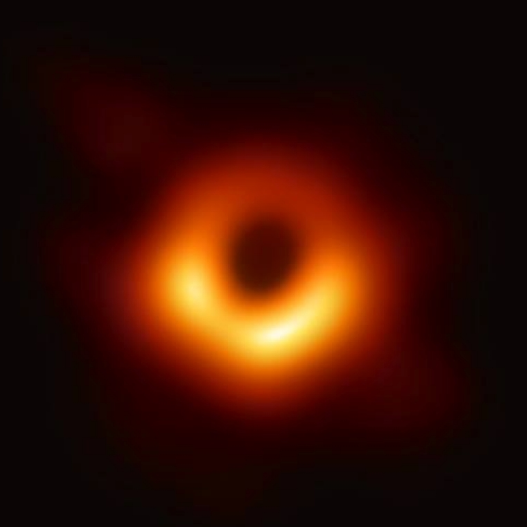 What we actually saw in that now iconic orange swirl was some of the most direct influence a black hole has on the universe. At the middle of a nearby galaxy called Messier 87 sits a monster black hole – 3 million times the size our Earth and weighing equal to 6.5 billion Suns. It is one of the heaviest black holes we know of. The picture to the right shows particles of gas and dust stuck in a death spiral, spinning at absurd speeds, heated to millions of degrees, emitting more light than all the surrounding stars, about to be sucked beyond the eternally-mysterious event horizon. It’s like seeing just the rings of Saturn, while the planet itself remains invisible. On Earth, astrophysicists linked data from 8 telescopes across three continents to form the Event Horizon Telescope (EHT), allowing a team of 200 scientists to scan the Merrier 87 galaxy over a period of 10 days. Although the telescopes are not physically connected, they were able to synchronise their recorded data with atomic clocks — hydrogen masers — which precisely time their observations. They gathered 5 million gigabytes of data, backed it up onto an array of hard drives and flew them to centralised locations for processing. The image we saw released on Wednesday morning was the result of an algorithm for processing that incredible mound of data into a simple picture - an algorithm written by MIT graduate Dr Katie Bouman. Three years ago, Dr Bouman led the creation of the algorithm in her computer science and artificial intelligence lab. The EHT gathered a mind-bending amount of data, but it was “sparse and noisy” in its raw form. “We developed ways to generate synthetic data and used different algorithms and tested blindly to see if we can recover an image,” Dr Bouman told CNN. Hers was one of three teams, each working with different algorithms, all on the same data. All the images turned out essentially the same. “No matter what we did, you would have to bend over backwards crazy to get something that wasn't this ring,” Dr Bouman said. The light that the EHT picked up after travelling for 55 million years to Earth was not the orange-ish hue seen in the image above – it was a much larger wavelength than visible light, so it had to be compressed. The researchers created a colour map - yellow is the most intense light emission, the red is less intense, and then black is little or no emission at all. If the wavelengths were the optical range, the ring around the black hole be closer to white, tinged with blue or red, they said. The black hole’s ‘halo’ is circular, but brighter on one side. This is because some of the light is approaching Earth, while some of it is on its way around the back of the black hole (but weirdly, we can still see it reflected). The brighter light is enjoying a boost from the distorted space-time of the black hole, making it seem closer and brighter. One hundred years ago, two expeditions set out off the coasts of Africa and Brazil to observe the 1919 solar eclipse, with the goal of testing the current model of physics by seeing if starlight would be bent around the limb of the sun, as predicted by Einstein. In a century-long echo of those observations, the EHT project has used some of the world's highest and most isolated radio facilities to once again test our understanding of gravity in its most extreme expression. In 2016, with the first ever detection of gravity waves, we gained a new ability to ‘hear’ black holes in distant space. With this week’s revelations, we can now ‘see’ them too.